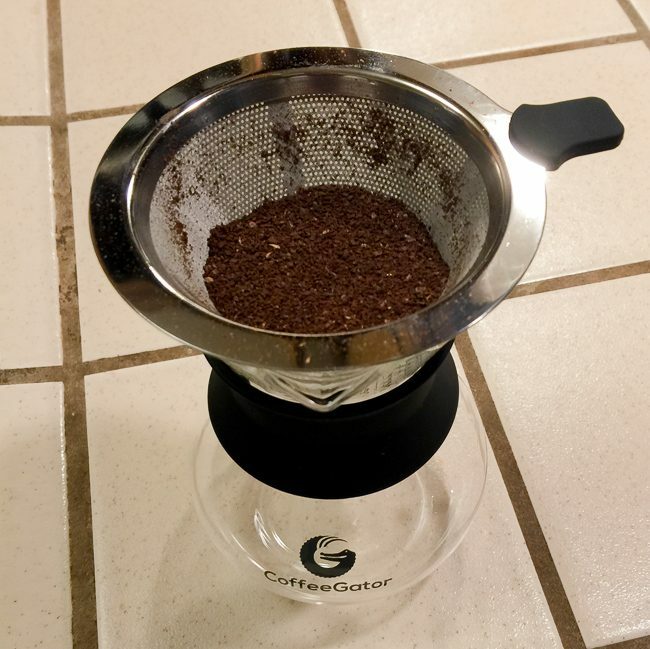 I have several standalone pourover cone coffee drippers, but the Coffee Gator is a little different in that it comes with a matched glass carafe and includes a stainless steel reusable cone filter. 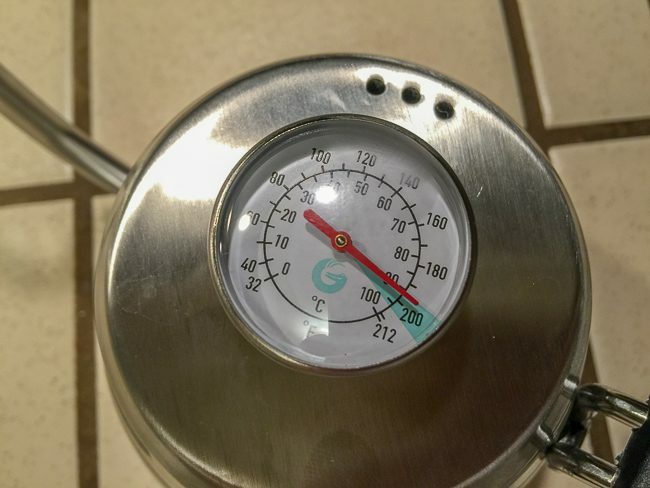 Strangely enough, I don’t have a proper kettle, so I am looking forward to using the Coffee Gator stainless steel kettle with built-in thermometer, which takes the guesswork out of getting the proper temp. I will review these items together since they complement each other well. The stainless steel kettle is very well made and holds 1 liter (32 ounces) of water. The lid has a built-in thermometer, with a nice colored indicator for the optimum temp range of 195F-205F. The spout is long and nicely shaped, and the handle comfortable. Since you cannot put metal in the microwave, you can heat water in the Coffee Gator Kettle directly on a stove (Gas, Electric, Induction or Halogen are fine according the manufacturer). Or you can heat it in a separate electric kettle like I did, and then pour it into the Gator and put the lid on. My first couple tries I put water that I thought was hot enough, but the temp gauge told me it wasn’t so. It seems to works best when the water gets to a rolling boil for a while before transferring to the Coffee Gator. Another reason why that temp gauge is so useful. 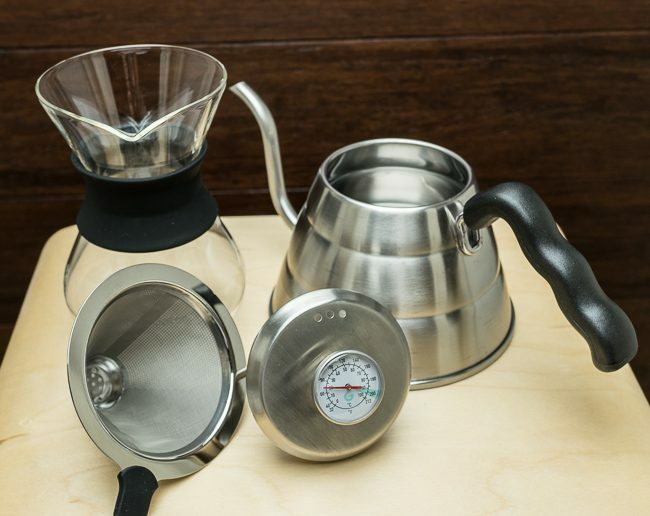 The glass carafe is nicely shaped and the top section is designed to hold the included stainless steel cone filter perfectly. It holds 300 ML (10 ounces) of coffee, and does not have a handle, but instead provides a piece of rubber insulation that provides a cool spot to hold on to. The stainless steel cone has a little tab handle which makes inserting and removing it easy. Cleanup is very easy, just a few seconds under running water. I filled the cone up about half way with medium grind Ethiopian Harrar coffee, and heated some water in a glass pitcher in the microwave until it came to a rolling boil for about 30 seconds. I then transferred the boiling water to the kettle and waited for the thermometer to indicate the proper temperature of about 200F. As I began to pour water over the coffee, I found the kettle spout provided very precise pinpoint control, which is refreshing. The resulting coffee was very nice, if a little on the light side. I felt the extraction time could have been a little longer, so I tried again with a finer grind. The finer grind did improve the extraction time and taste, and the amount of silt at the bottom of the cup was minimal, but this is expected with any metal filter. 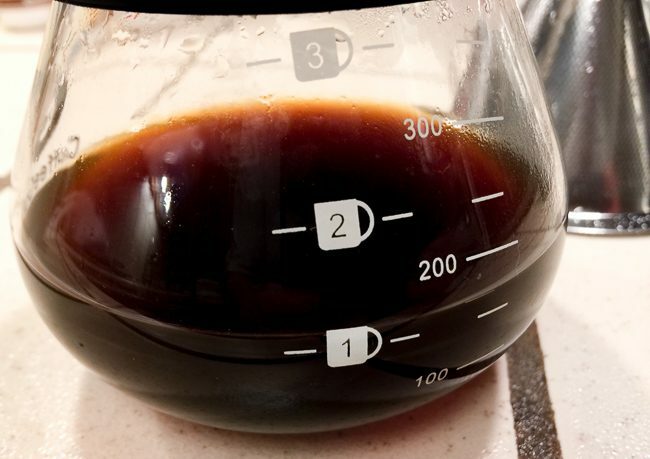 I would love to see a future cone filter option where the flow can be adjusted or stopped altogether, similar to the Clever Coffee Dripper. I really like the kettle, especially the built-in temp gauge in the lid. 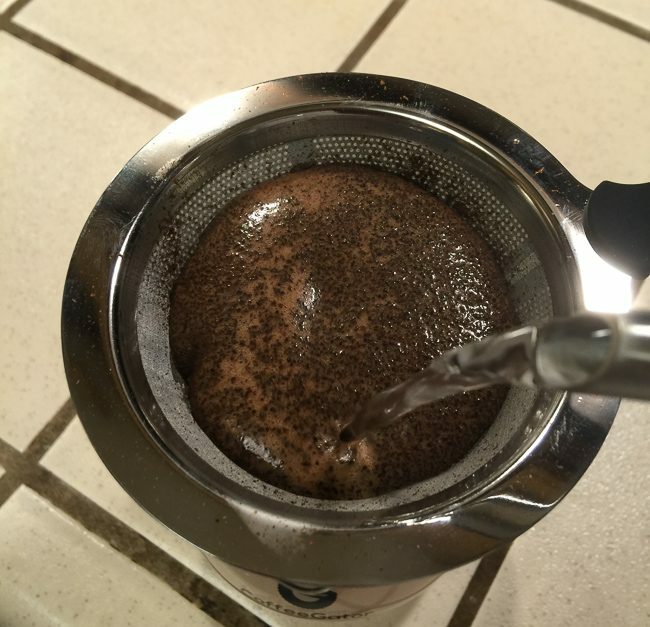 The precise spout was also such an improvement over the makeshift pitchers I had been using, that this will definitely become my go-to for anything pourover. The coffee carafe also produced a tasty cup of coffee, but I would probably opt for one of the larger ones also made by Coffee Gator, which come in 450 ML and 900 ML sizes and are nearly the same price. These larger units also provide a traditional handle. 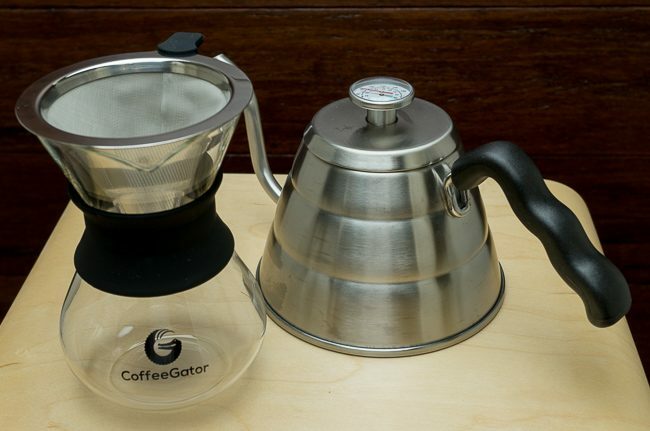 If you are tired of not knowing the temp of your water or buying paper filters, the Coffee Gator Carafe at about $25 USD and the Kettle at about $40 USD are well-made products that don’t break the bank and produce great results.